Glenn W. Smith, left, and Peck Young in the KOOP studios in Austin, Friday, September 7, 2012. Photo by Tracey Schulz / Rag Radio. 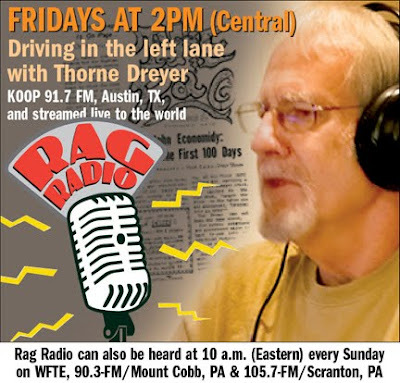 Prominent political analysts Glenn W. Smith and Peck Young were Thorne Dreyer's guests on Rag Radio, Friday, September 7, 2012, on KOOP 91.7-FM in Austin. They discussed the recent Republican and Democratic national conventions and larger issues related to the 2012 presidential elections and electoral politics in American society today. Glenn W. Smith has spent the past 30 years as a writer, campaign manager, activist, and think tank analyst. A former political reporter for the Houston Chronicle and Houston Post, Smith led Ann Richards’ successful 1990 campaign for Governor of Texas and worked for Texas Lt. Gov. Bill Hobby and U.S. Senator Lloyd Bentsen. He’s coordinated national campaigns for MoveOn.org. and was a senior fellow at George Lakoff’s prestigious Rockridge Institute in Berkeley. Smith is the author of The Politics of Deceit: Saving Freedom and Democracy from Extinction, writes regularly for The Huffington Post and FireDogLake, and created the popular DogCanyon website. Smith has appeared as a political analyst with Chris Matthews, Joe Scarborough, Brit Hume, and many others. Peck Young, who worked for 30 years as one of Texas leading political campaign strategists, is Director of the Center for Public Policy and Political Studies at Austin Community College. He has worked as a consultant with Texas Governor Ann Richards and numerous other leading Texas political figures, and for the presidential campaigns of Michael Dukakis, Bill Bradley, and Bill Clinton/Al Gore. Young has received many professional honors and has been a force in Austin politics, working for renewable energy and single-member City Council districts, and drafted the city’s first Ethics, Financial Disclosure, and Lobby Registration ordinances. This podcast includes original politically-themed topical songs by Austin singer-songwriter and "eco-troubadour" Bill Oliver that were first performed on the August 31 program. KOOP underwriting announcements and fall membership drive fundraising pitches have been removed from the podcast. THIS FRIDAY, September 14, 2012: Famed Texas civil rights and labor attorney David Richards. September 21, 2012: Singer-songwriters Bob Cheevers and Noelle Hampton & Andre Moran.